Scrangie: Reminder: Three Free Nail Polishes From Zoya! Hey everyone! Zoya has extended this generous offer until the 19th (Saturday) so you'll have one extra day to get your hands on my three favorite Zoya polishes for free! 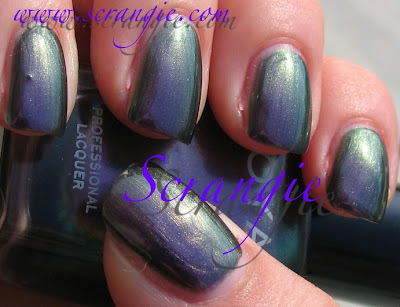 Just visit http://www.zoya.com/scrangie and enter code SCRANGIE3 at checkout! Again, I'm so excited about this! Thanks Zoya! The futuristic, fabulous, shimmering Trixie! And my baby, Ki! She's a chameleon! See the many faces of Ki? Or is it silvery green? Maybe it's blue silvery green? LOVE your swatches and nails! Can I ask you a personal question, though... do you have ties to New Zealand? Don't answer if you don't want to. I do have Jasmine. Ki looked horrible on me. I probably too warm for Trixie... But I want Q balm. nah, surprisingly, I don't have an urge to get any of 3-free combo. : ( I still haven't gotten mine, I'm dying. Steph, oh no! Is your Ki on backorder too? Usually they're so quick! 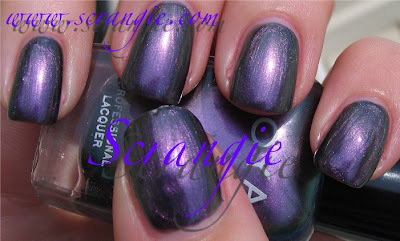 I was trying to take advantage of your zoya deal since today was the last day, but the zoya site is down. Everytime I try to go to zoya.com it says that it is not connecting. I have tried to connect from all the computers in my house. I can go to any site except zoya. I don't have the number to call either. Do you think you could help me? Thanks! It seems the Zoya site is working fine for me, but really slow. Hope everything turns out okay! Thanks for the reply and the phone number! I called and they are closed on Sundays. I guess it's just my dumb computers. Devin, I've let Zoya know about the problem you're experiencing, so I'll see what they say about it :) In the meantime, have you checked you cache and cookies? My computer does the same thing when I try to go to The Body Shop online, and I just have to delete the cookie and try again and it usually works. Sometimes I get a page from my ISP saying "website cannot be found!" and I remove the cookie for that site too. You're very welcome, Devin! Let me know if you need anything else :) I'm always happy to help! Hey there Beautylover! Don't worry, Ki is on backorder and once they have it in stock, they will ship it to you :) I will find out when they expect to have it back in stock! I ended making making 3 orders. So I also used the UP3 and PD3 codes. Any idea scrangie when the KI will be shipped? I got all of my other stuff. LOL I went from 0 Zoya nail polish to 12 zoya nail polishes overnight! CRAZYINESS! Again your swatches have been very beneficial to me! I'm trying Zoya for the first time, due to their new Twitter special (3 free polishes!). I'm trying Ki, Eve, and Malia. I wouldn't have given Ki a second look without your description and swatches. Thanks, Scrangie!! !